The Joovy Room Playard is a sturdy and solid pack and play that is perfect for keeping in one place, like in parent’s bedroom for long term use. It’s an all-in-one nursery that has everything needed to care for a baby, so you don’t need all the extra furniture like changing tables, cribs, bassinets, and storage units. Due to the large size, it’s also a great pack and play that will grow with your baby, allowing you to get some long use of out it. The Joovy Room Playard is perfect for those looking for an all-in-one nursery with tons of storage, a bassinet, a changing table, and included mattress sheet. The Joovy Room Playard is the pickup truck of pack and plays because of its storage, sturdiness, and all-in-one features. It’s built like a brick house with an extremely sturdy frame and high weight limits for your kiddos allowing you to get the most use out of this system. It can be used from birth up until your child is 35 inches tall or until they are able to climb out. There is no weight limit for the playard itself. A changing table is an awesome feature included with the Joovy Room Playard, making it a full-on nursery. Included is a bassinet and changing table that do have weight limits, and they are pretty high compared to other pack and plays. The Joovy Room Playard Bassinet is able to hold babies up to 15 pounds and has metal rods that make it a sturdy bassinet. A lot of other pack and play bassinets are just secured to the top frame of the crib, but the bassinet for this system has many support bars and attachments, making it sturdy and secure. A changing table is an awesome feature included with the Joovy Room Playard, making it a full-on nursery. The changing table secures to the frame of the playard and is built solid, holding up to 25 pounds. A belt is also included to secure your precious little package so they don’t decide to roll away. The fabric and materials used in the Joovy Room Playard aren’t made with known flame retardants and is PVC, BPA, BPS, and phthalate free according to the Joovy Team independent testing or certifications. This doesn’t make it an unsafe product, it’s just always a good thing to look for when buying baby products. The Joovy Room is also made with very durable fabric that will hold up to a good amount of use and abuse. There are a few features that set the Joovy Room Playard apart from other pack and plays. A bassinet is included and helps littler babies feel closer to mom and dad. Two sides have mesh that helps babies to see their surroundings, as well as aid in ventilation, and help caregivers to visualize whoever’s on the inside. A crib sheet is also included for the mattress, something you’ll very rarely find with any pack and play systems. It’s specially fitted for the Joovy Room’s mattress and can be removed for easy cleaning. A really fun and unique feature included with the Joovy Room Playard is that it comes with its own white noise, nightlight, and music options. Parents will really enjoy the bassinet and changing table features which might prevent a sore back in the long run. The changing table is set at a comfortable height for diaper duty and is made with a vinyl material that is easy to wipe down. The bassinet hangs a little lower than normal for many travel cribs. But, the lower height increases the safety and durability of the bassinet, so there’s a little trade off. Also, the Joovy Room Playard sits a few inches off of the ground, allowing for airflow and a buffer between the floor so your baby is at a comfortable temperature. A really fun and unique feature included with the Joovy Room Playard is that it comes with its own white noise, nightlight, and music options. This is unheard of in the pack and play market and is a great option if your kiddo is used to music or white noise while sleeping. There’s also an option to plug in your own music that can help soothe baby to sleep. These options are located directly on the Joovy Room and are operational with the push of a button. Remember when we said the Joovy Room Playard is the pickup truck of pack and plays? This means that the size is a little larger than other travel cribs. The sleeping area for the Joovy Room is pretty standard (with a tad more room) for a pack and play. But due to the extra storage features and sturdy frame, the overall footprint of this travel crib is a little larger than other pack and plays. Unfolded dimensions are: 49 inches x 35.5 inches x 34 inches (LxWxH). This is great for longevity, but might be a tight fit for tiny rooms and small spaces. Folded dimensions are: 31 inches x 15 inches x 10.5 inches (LxWxH). 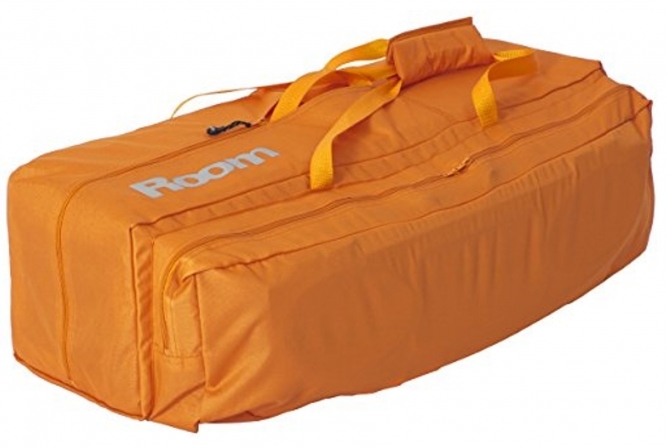 Also, the Joovy Room Playard weighs in around 34 pounds when everything is packed away, making it the heaviest pack and play we’ve reviewed. The dimensions and weight make this a hard pack and play to travel frequently with, although it can be done! 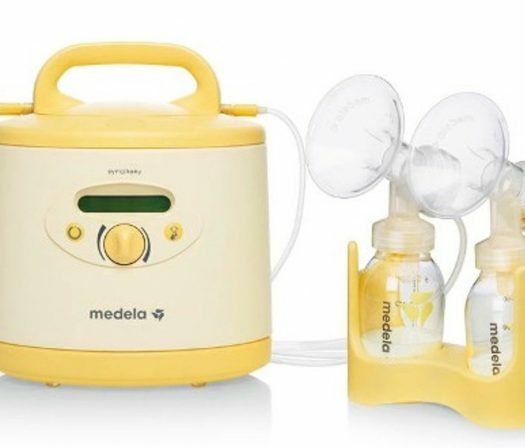 Due to the size, many parents use this unit as an at home nursery in their bedroom allowing for baby to sleep in mom and dad’s bedroom for a longer time. This also adds to the convenience of not needing all the extra furniture like a changing table, diaper storage, a bassinet, and a crib. A ton of great features come with the Joovy Room Playard that make it a great all-in-one nursery. This throws away the need for a bassinet, changing table, crib, and other storage for diapers, clothes, and wipes because these are all included with this unit! Most parents love the storage compartments for nursery necessities. This parent organizer can hold up to 9 pounds of supplies (let’s be honest and say that many parents probably push that limit) and includes 9 storage compartments with a hard plastic top for wipes. A lot of moms rave about the storage container, saying that it’s awesome for those who use cloth diapers. A ton of great features come with the Joovy Room Playard that make it a great all-in-one nursery. The materials used in the Joovy Room Playard are mostly water resistant and easy to spot clean (which is all you’re allowed to do with this system). The included mattress sheet is removable and machine washable, but ever other part needs to be spot cleaned with a mild soap and water. 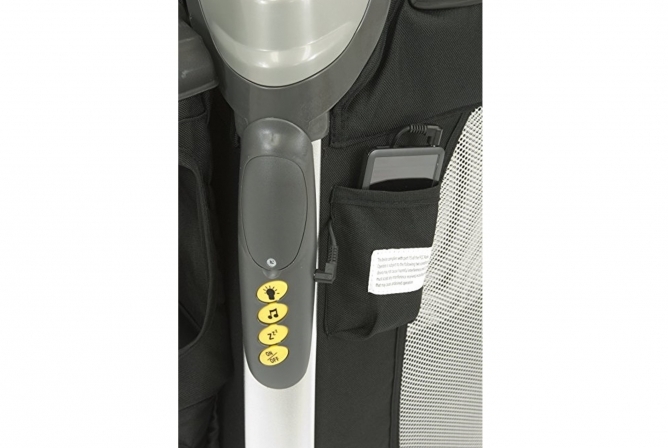 A travel bag is also included in the Joovy Room, allowing for easier transport of this system. Since we’re talking about transport, let’s address the difficulties some parents might have. 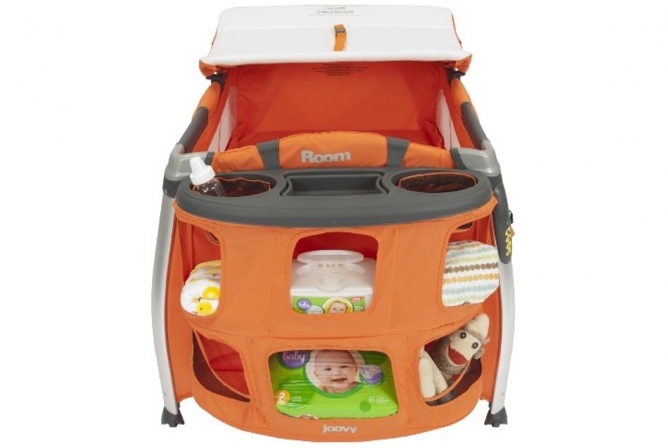 The Joovy Room Playard is a heavy unit, weighing in around 35 pounds which is a beast compared to other pack and plays. It also has a lot of steps for assembly and takedown, so expect to spend a lot of time setting it up and disassembling while traveling. The numerous features and accessories are awesome to have but ultimately add to the difficult setup. Additionally, some state that the Joovy Room doesn’t fit through doorways while assembled. However, it doesn’t come with two wheels, making it easy to move from point A to point B while assembled (if you have big doorways). 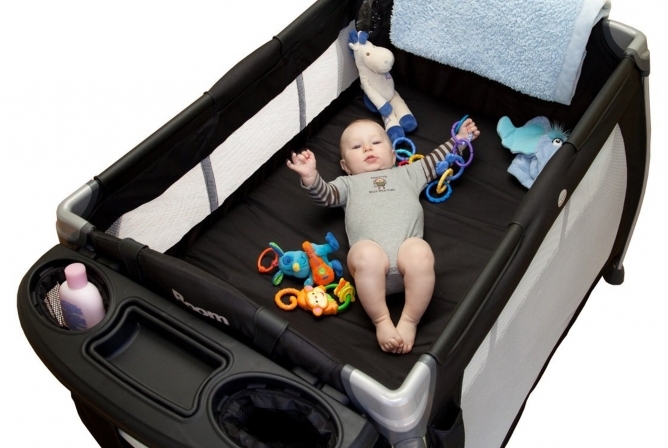 Longevity could be a great feature with the Joovy Room Playard. It is able to be used from birth up until your baby is 35 inches tall. There is no weight limit due to the sturdy construction. The bassinet weight limit is fair, allowing it to be used until your baby is at least a few months old. Due to the larger size (49 inches long), this pack and play will easily grow with your kiddo. With a reasonable price (Check it Out Here! ), especially for all the features, the Joovy Room Playard is a great option for parents looking for an all-in-one nursery. Additionally, the Joovy Room includes a mattress sheet which is a very rare feature for many pack and plays. To purchase an extra sheet for a pack and play usually costs at least another $20, so this is a nice save with the Joovy Room Playard. Additionally, the Joovy Room includes a mattress sheet which is a very rare feature for many pack and plays. As well as the amazing storage, bassinet, changing table, and safe crib, this pack and play includes a techy feature in the form of music options, white noise, and a built-in nightlight. This is a really useful feature for babies that are used to all these comforting devices during sleep, and useful for parents that sometimes forget to pack these simple devices while traveling. In the end, the Joovy Room Playard is a sturdy and solid pack and play that is perfect for keeping in one place, like in parent’s bedroom for long term use. It’s an all-in-one nursery that has everything needed to care for a baby without all the extra furniture like changing tables, cribs, bassinets, and storage units. Due to the larger size, it’s also a great pack and play that will grow with your baby, allowing you to get some long use of out it. However, due to the large size, the Joovy Room might be hard to travel with. It does include a travel bag but weighs about 34 pounds. So for parents that frequently travel, it could be a cumbersome pack and play. Setup and take down is also more difficult and takes a lot of time. Due to these factors, the Joovy Room Playard is usually a great fit for parents looking to keep a compact nursery at home without all the added furniture. This also makes it great for families with smaller houses that want to keep baby sleeping in the same room as mom and dad, or as a permanent pack and play for grandma and grandpa’s house.